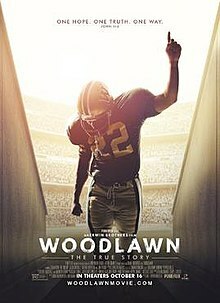 When Woodlawn High School in Birmingham, Alabama is controversially desegregated in 1973, Tony Nathan, a gifted black high school football player, joins the school's predominantly white football team along with several other black players. The coach, Tandy Gerelds, tells the team to use their shared anger to unite them, but black and white players clash on and off the field. After a riot at the school, Gerelds consents to allowing traveling sports chaplain Hank Erwin to speak to the team as a "motivational speaker". Hank's speech moves nearly the entire team to accept Hank's invitation to commit their lives to Jesus Christ, and join together in prayer. Gerelds does not accept the invitation, and is unsure what to make of the event. The team loses its first game, but after Gerelds decides to play Nathan over the objections of some of the white players' parents, win their next game. Nathan becomes a breakout star, and the team goes on a long winning streak leading up to their final game with rival Banks. Banks coach "Shorty" White instructs his players to target Nathan, and the repeated hard tackles take their toll. Nathan scores a touchdown, but is injured by a vicious late hit and is unable to continue playing. Woodlawn loses, but Gerelds expresses pride in his team for "the men they've become". Gerelds eventually seeks out Nathan's church during a Sunday service and asks to be baptized. Hank arranges a meeting between the Woodlawn players and Banks players, leading to a spiritual awakening on the Banks team as well. Gerelds and White hold an unprecedented joint football camp before the 1974 season, and a camaraderie develops between the two teams. Both go undefeated for the season until their final game against each other, which because of the stardom of Nathan and Banks quarterback Jeff Rutledge, draws a huge record crowd. A few years later, now working as an insurance agent, Gerelds admits to a customer that while they lost the game, the transformation he witnessed was miraculous. After Nathan, now playing for Alabama, carries his team to victory in the Sugar Bowl, he calls Gerelds at home and expresses his gratitude, encouraging him to return to coaching. Woodlawn grossed $14.2 million. In the United States and Canada, the film opened simultaneously with Bridge of Spies, Goosebumps, and Crimson Peak on October 16, 2015. On the film's opening day it grossed $1.5 million, above studio expectations. In its opening weekend, it grossed $4 million, finishing 9th at the box office. Woodlawn has received generally positive reviews from critics. According to the review aggregator website Rotten Tomatoes, 73% of critics have given the film a positive review based on 15 reviews, with an average rating of 6.37/10. At Metacritic, the film has received a weighted average score of 57 out of 100 based on 4 critics, indicating "mixed or average reviews". On CinemaScore, audiences gave the film an average grade of "A+" on an A+ to F scale. ^ "Upcoming Movies in Theaters". Boxofficemojo.com. August 7, 2015. Retrieved August 21, 2015. ^ "AMC Theatres: Woodlawn". AMC Theatres. Retrieved October 1, 2015. ^ "Woodlawn – PowerGrind". The Wrap. Retrieved August 14, 2017. ^ a b "Woodlawn (2015)". Box Office Mojo. Retrieved December 21, 2015. ^ Chou, Marvin (March 16, 2016). "Tandy Gerelds' Impact has Touched the Nation through the Movie "Woodlawn"". ahsaa.com. Retrieved August 6, 2016. ^ Poupart, Alain (June 25, 2015). "Nathan Caps Memorable Year With "Woodlawn" Movie". Miamidolphins.com. Retrieved August 21, 2015. ^ McNary, Dave (November 20, 2014). "'Woodlawn': Jon Voight Starring as Bear Bryant in Football Movie". Variety. Retrieved August 21, 2015. ^ "Woodlawn (2015)". Rotten Tomatoes. Fandango. Retrieved April 20, 2019. ^ "Woodlawn Reviews". Metacritic. CBS Interactive. Retrieved November 3, 2015.